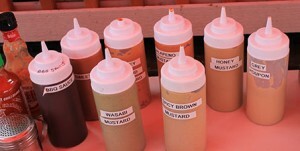 Hotdogs to die for. 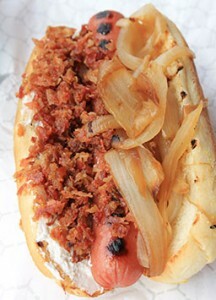 There is something to be said for the good old all American Grilled Hotdog on a toasted bun. As a kid one of my fondest memories was waiting impatiently for the “Dogs” to get done on the grill. Standing there tapping my feet, looking at the most delicious food in the world. Something about the smell of the grill and the sizzle and snap of the hotdog cooking would just make my mouth water. As I got older there was still nothing that could take the place of a grilled high quality all beef frank. I’m not talking about those rinky dink hotdogs that Dad would give the kids while he saved the good stuff for the adults. I’m talking about the all beef Polish Sausages, 1/4 of hotdog goodness. Delicious with an ice cold beer or Coke. We also cater to those with a sophisticated palate. We decided to one up the regular hot dog vendors. 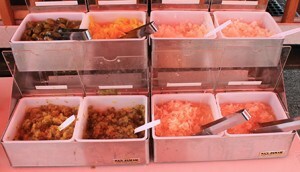 We offer 20 different serve yourself condiments, plus 3 PREMIUM toppings to take your meal to the next level.